Understanding How to Keep Copper Sink from Turning Green! Have you seen a light green color on the statue of liberty? That is the shade that comes because of copper. This is a pigmentation that happens on copper and some other materials like bronze and brass. It happens mostly because of exposure to salty air or sea water. In most cases, weather becomes the main reason. So if you have a copper sink, there is a need to know if the toning will ever take place. There are some possible ways to keep the pigmentation away from your precious sink. So what are those proper measurements? Today’s writing will include how to keep copper sink from turning green. 1 Understand Your Weather & Environment! 2 Can They Be Removed? 2.1 What Stuff You Should Be Careful Of? 2.2 Proper Maintenance Is The Best Cure! Understand Your Weather & Environment! This is a case that not happens usually. But still, there are chances. Most of the copper sinks are installed indoors. That’s why there is a very less probability of these sinks suffering from green spots. However, if you live near the sea and your sink is installed nearby salty air, this may happen soon. So better take proper requirements. Verdigris or green spots develop because of salt. Some even like the spot and try to preserve it. We’ll discuss that some other day. Also, there are a few soaps that disturbs a copper sink. Later they lead to green spots. So be sure before using a cleaner for your sink. Green spot can be easily removed even if it develops in your copper sink. But the finish may get affected. That’s why you should try your best to keep it away. Some ingredients are really helpful to get rid of such unwelcoming spots. You can try store-bought cleaners that are meant for such spots. Also, you can go for vinegar or even lemon. They are quite effective to restore your surface. Be sure to scrub in a gradual and soft way. Don’t harm the finish out of panic. You need to be scrubbing in direction with grain. That way you’ll be extra safe. Also never go for hard bristle tool for cleaning. A simple sponge or toothbrush will be enough. Make sure you read the manufacturer’s guideline beforehand. Don’t use any ingredient that it says not to. What Stuff You Should Be Careful Of? There are some elements that are really harmful and can cause green spots. You should be careful about them to avoid such spots. Copper sink needs your attention and proper Maintainance. So be sure to avoid anything that can make an ugly spot on it. Acidic foods are one of the most harmful things. 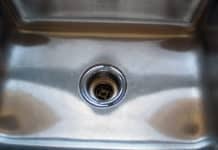 If your sink faces such elements like ketchup, pepperoni, oils, tomatoes, citrus, soda, and oily chips then the chances of such spots become higher. Make sure to clean the surface if they encounter. Also, be cautious of cosmetic items. Make-ups and shaving creams can really affect the finish. Also not cleaning toothpaste fall on your copper sink can cause such discoloration. Be sure to regularly clean after you do your makeup or brush teeth. Don’t just keep it aside and think to clean it once you are free at night. The harmful effect will be done by then. 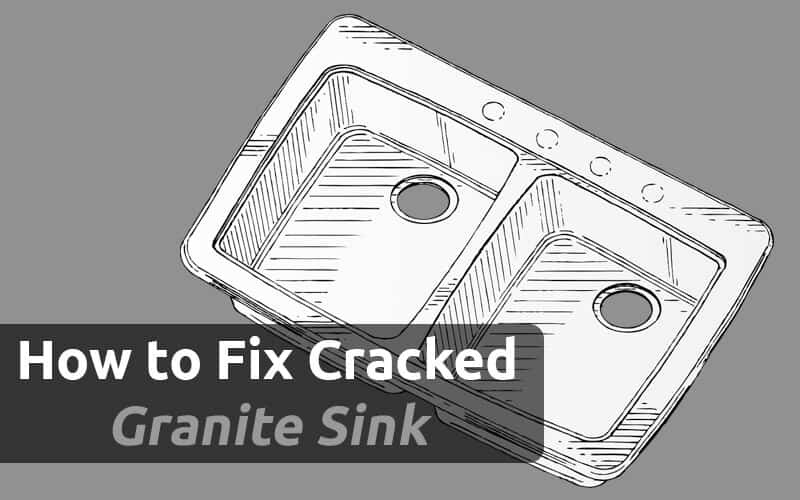 You should not let abrasive chemicals have contact with your copper sink. 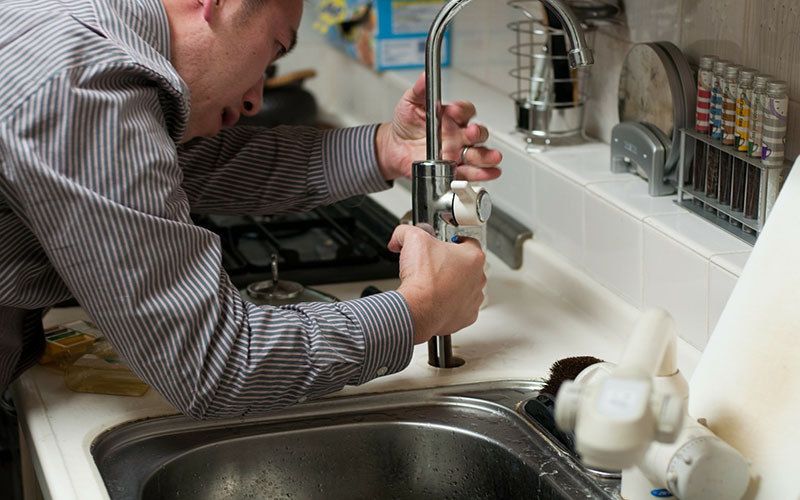 Stuff like drain unclogging chemical and bleach is very harmful to ruin your sink. 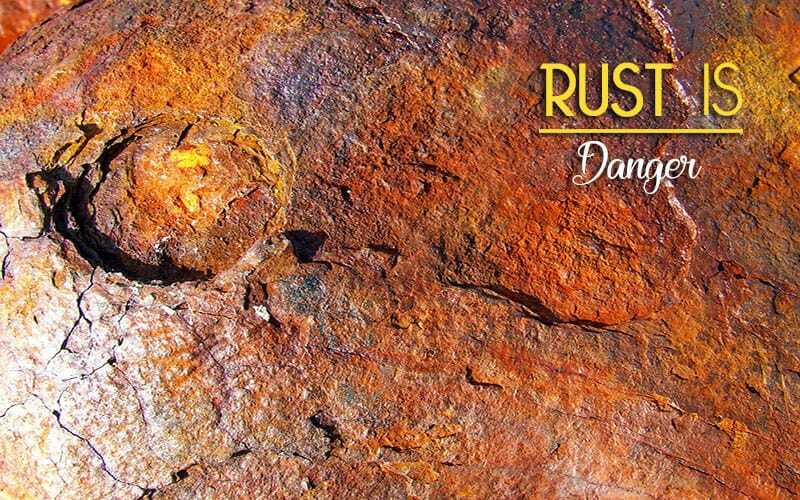 Don’t follow cheap tricks that say to use such strong elements on your copper sink. It will only do negative. A bare copper sink can discolor even with your finger’s oil. That’s the reason why you should wash and pat dry this sinks more than often during each day. Proper Maintenance Is The Best Cure! There is no such miraculous way or trick that can give you a better result than regular, gradual and proper maintenance routine. 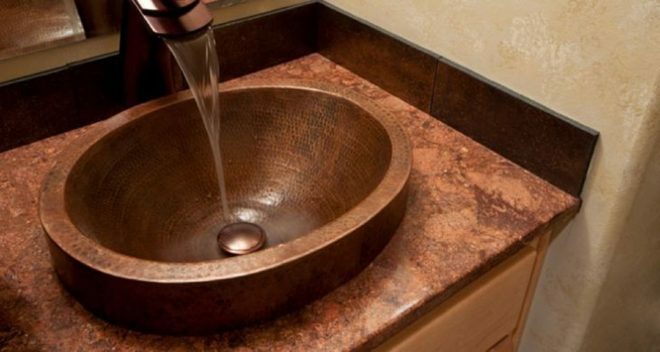 This is the best way to stop green spots ruining your copper sink. There are some rules you should follow. You should avoid some element’s contact with your copper sink. These are heat, food particles, and cold, air and oil elements. I know that’s not entirely possible but try to keep it minimum. 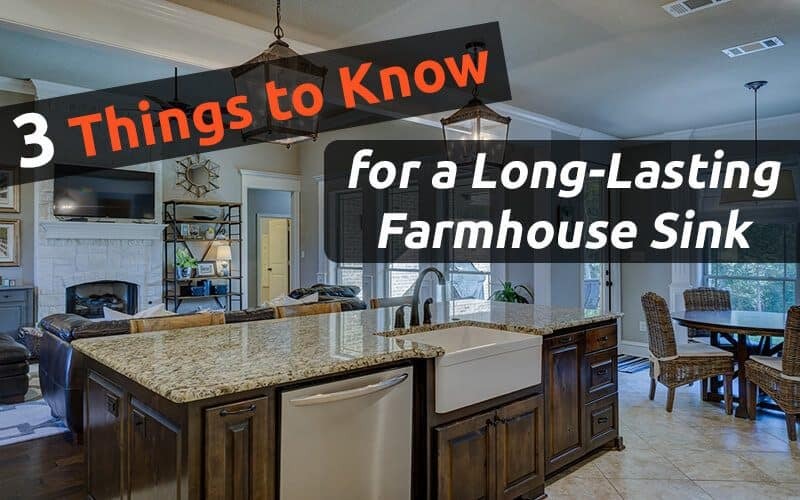 Your finger oil, hard water, and soap are also included in this list. Always try to keep the patina dry. You should wash it after every use and wipe the water. Never let it dry itself. That way you’ll encounter a spot even faster. When you use any soap make sure it’s PH balanced. Do the same for cleansers also. Anything that is high of acid or alkaline should be a big no. Buff or wipe it daily even when it is dry. That way you’ll avoid any unacceptable developing. This is the easiest way to preserve the finish you have. It will just lock the current surface from anything touching it. Get an old-fashioned wax that is used for furniture. Or you can try copper wax and beeswax. Apply these coating on your clean sink surface. The wax will slow down the development greatly. It will stop oxidation as well. You should use a circular motion to apply such wax. Also be sure to do this with a soft cloth or fabric. Make sure that you use these waxes after every cleanup. There are even some coatings that are permanent. But it would be better to call for professional assistance. Trying to apply such coating yourself is not really recommended. You can do it if there’s previous experience. But otherwise, the results may not be nice. So these are some of the finest way to keep green spots out of your valuable copper sink. I hope you have known something new and loved it. Do better to maintain their shine as well. Often a loss of shine means that your sink is more prone to green spots and other tarnishing. A shiny, spot free copper sink will multiply your home deco looks twice! I hope you enjoy a beautiful looking copper sink for a lifetime. Good Luck! In case you may also check! How to Remove Chemical Stains from Stainless Steel Sink! 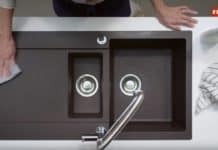 How to Clean a Franke Sink And Keep It Sparkling Forever! Hello, This is George. I am an old blogger and my profession is Engineering. I am a Sink & Faucet Expert. Working as an Associate Engineer at SS Industry. Keep on visiting for more Solution. Thanks. 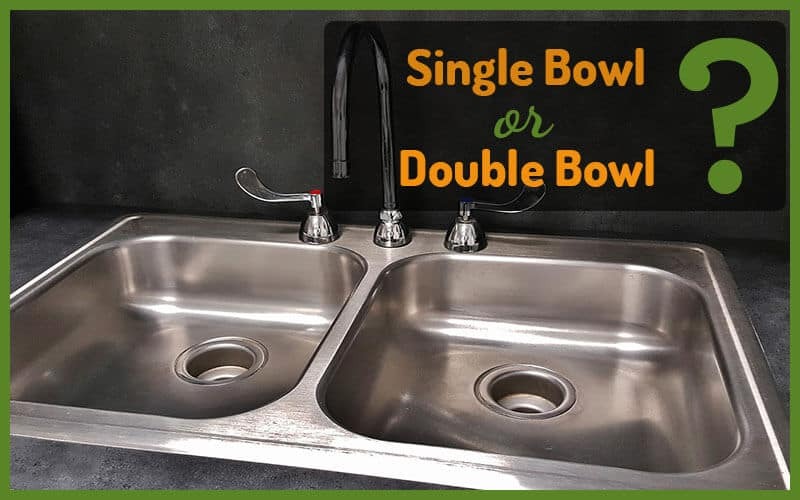 Single Bowl VS Double Bowl Kitchen Sink?